Apeaksoft MobieTrans kolayca çeşitli iPhone verisi transferi, iPhone zil sesi ayarlama ve HEIC resimleri dönüştürme gibi işlemleri yapabilen bir araçtır. 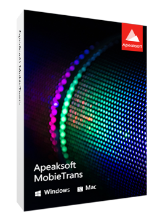 Apeaksoft MobieTrans kolayca çeşitli iPhone verisi transferi, iPhone zil sesi ayarlama ve HEIC resimleri dönüştürme gibi işlemleri yapabilen bir iOS veri transferi ve yönetimi aracıdır. 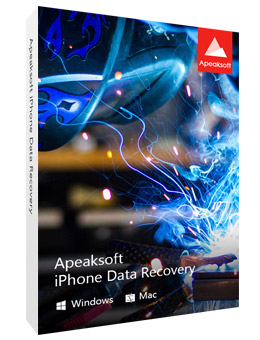 Apeaksoft iPhone Data Recovery is the toolkit of iPhone, iPad and iPod. It can be the data recovery software to retrieve the deleted text files (contacts, text messages, call logs, notes, etc. ), and lost media content (photos, music, videos, etc.) from iOS devices directly, iTunes backup and iCloud backup. Compatible with the latest iOS, it lets you scan and recover data from iPhone X, iPhone 8, iPhone 7, iPhone SE, iPhone 6s/6s Plus, iPad Pro and iPad mini 4 on your computer. 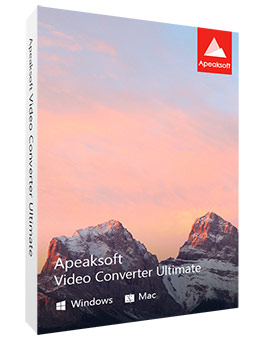 Apeaksoft Video Converter Ultimate is the all-in-one video converter, editor and enhancer. As the excellent video converter, it converts over 300 media formats for video (4K supported) and audio files, like MP4, MOV, MTS, M2TS, WMV, AVI, 3GP, MP3, FLAC, WMA, AAC, AIFF, OGG, homemade DVD, etc. When you want to edit the media file, do not miss its powerful editing features, rotate, flip, crop, clip, watermark, adjust effect, merge, etc. to get your customized videos in minutes. Still you can be the professional video dealer to enhance your video quality in 4 ways like noise removal, shaky reducing, etc. Get this super useful video converter to empower your media files now. Note: In the latest upgrade, it supports external subtitle adding and editing, and extra audio track(s) adding and deleting. 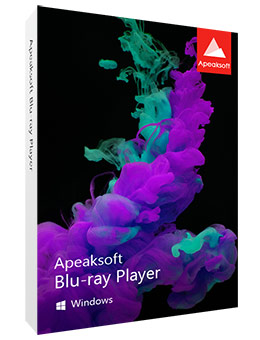 Apeasksoft Blu-ray Player can be as the multi-functional Blu-ray player on your Windows 10/8/7/Vista/XP. It does well in playing Blu-ray disc (an internal or external Blu-ray Drive is needed), folder and ISO files, even the latest-released Blu-ray movies. Additionally, it can be as a common media player to play video and audio file like MP4, MOV, MKV, AVI, MTS, M2TS, FLV, MP3, AAC, AIFF, FLAC and more, even 1080p and 4K video supported. What’s more, it allows you to set audio track and channel to enjoy perfect audio quality. Optional video playing size (half/normal/double) can be adjusted to fit your screen freely. 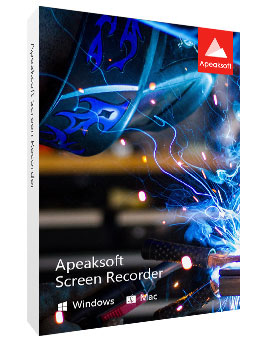 Apeaksoft Screen Recorder, the powerful screen capture software which enables you to record video and audio on your computer in high quality. It lets you record streaming videos, live songs, online meeting, online game video, video tutorial, and more on your computer for sharing easily. It also kindly gives the option to edit the video while recording like drawing, caption, callout, blurry, etc. Recording area can be customized as window lock or exclusion, and schedule recording is supported when you are not sitting in front of computer. Recording your computer screen in super high resolution up to 4K and export it for universal playback on your any player. 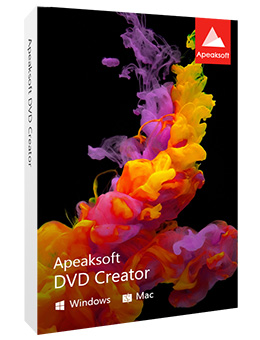 Apeaksoft DVD Creator is specially designed to edit video and burn it to DVD disc, DVD folder or ISO file. When you want to burn MP4 to DVD, this DVD Creator can be your great helper. Video in any popular video format like MP4, MOV, AVI, MKV, FLV, etc. can be used to create DVD. 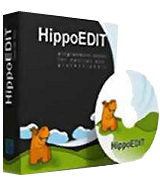 What's more, many key editing functions are offered in this DVD creating tool. You can handily crop/clip/rotate video, adjust image/sound quality, edit DVD menu, add new audio track or subtitle and more. Actually, it also can work as a powerful Blu-ray creator to help you burn video to Blu-ray disc/folder or ISO file in high quality. Copy, transfer, and back up files from iPhone, iPad, or iPod to your. GOATD "comments" are becoming more and more about 'I cannot register, I cannot activate' than anything else. Yesterday there was no software review comment at all out of 77. I wonder if GOATD might like to run a separate section for those with download and install difficulties? I do hope todays comment thread will be more informative though perhaps that is a forlorn hope seeing as how post number 3, in relation to software explicitly for Apple iOS, wants to know "does it work on Android?" Sheesh. Like most other programs of this exact same type -- this software REQUIRES iTunes to function. Something conveniently NOT mentioned anywhere in the description! So why not just use iTunes and avoid all this extra cost each year software?! Like most other programs of this exact same type -- this software REQUIRES iTunes to function. Something conveniently NOT mentioned anywhere in the description! So why not just use iTunes and avoid all this extra cost each year software?! Doesn't mention until you register, but it's only a 12month license. Installation and registration were easy, that's a great thing. It's bad that this program does not work at all. The startup of the program tells you that you should use iTunes. Installation and registration were easy, that's a great thing. It's bad that this program does not work at all. The startup of the program tells you that you should use iTunes.